BibleSearchers Reflections – On June 27, 2008, a giant step was made in the reconciliation between the North Korean regime of Kim Yong II, when North Korea presented his nuclear dossier on the history of its nuclear weapons program. According to the report, since North Korea first established its program by building the large nuclear reactor and research plant at Yongbyon with the assistance of the Soviets in the 1960s, today they have enough nuclear material to make over 200 1-5 kiloton nuclear bombs. Yet, it was with the assistance of Pakistan’s “Father of the Atomic Bomb”, Abdul Qadeer (AQ) Khan to actually build a nuclear bomb that they exploded on October 9, 2006. The Western world was suddenly aroused. According to the Russian military analysts analysis, documented within the 18,000 pages of the highly classified nuclear dossier on the North Korean nuclear weapons program, “the US Intelligence Community ‘shuddered’ at the full implication of Iran’s involvement in the building of North Korean’s nuclear weapons.” Only a partial revelation had hit the American intelligence community as far back as November 17, 2006. DEBKAfiles reported that in George Bush’s strategy review conference with the Iraq Study Group was the insight that twelve days before the North Korean’s first nuclear test on October 10, 2006, a secret Iranian military delegation of nuclear and missile experts were visiting Pyongyang. They were also taken to the North Korean site of the Yongbyon Reactor and also to the Punggye-ri Testing Site in the far north while they were preparing for the upcoming North Korean test. It was known at that time that the Chinese were already aware of the more intimate relationships between the Iranians and the North Koreans. They also knew that the Iranians no doubt had been briefed on North Korea’s secret preparations for nuclear testing and were “willing to instruct Iranian scientists and technicians in Pyongyang. They also gave them access to their secret testing site and taught them how to set up and execute a nuclear weapons test. The dots did not connect that the Iranian Revolutionary Guards were the financiers and already intimately involved in the nuclear testing program, as though it were the Iranian nuclear testing program being conducted by a surrogate country. Iran's Shahab-3 missile is a virtual copy of North Korea's Nodong (aka Rodong) missile – otherwise known to NATO as the Scud-D. North Korea has also sold this missile to Pakistan, which calls it the Ghauri. This fact in itself must sink in to our cerebral consciousness before the reality of its revelation begins to unfold. It was the opinion of the western intelligence services that has been presented to the American population is that Iran is developing a nuclear weapons program and is only in the developmental stage of the centrifuge preparation of a fuel core of fissible nuclear material. With the revelation of the North Korean program and the involvement of Iran in the development of their nuclear bomb meant, if these facts that true to their confession, Iran does already have nuclear bombs. Not testified was the fact that the ruling Ayatollahs and clerics have declared the intent to destroy Israel and eliminate them from the entire Middle Eastern region. The evidence is that the financing of North Korea’s nuclear research program that eventually led to the development of the nuclear bomb was funded by the, known in the western world as the Iranian Revolutionary Guard. Therefore, when Russian President Vladimir Putin denied at the Sochi Summit the United State’s charges that Russia was assisting Iran in building a nuclear power reactor at Bushehr, he denied that Russia was helping Iran secure weapons of mass destruction. This denial could very well be true, for Iran already had such weapons. When the American State Department and the Israeli government in Tel-Aviv accused the Putin government of supplying Iran with the secret knowledge on how to develop missile and nuclear technology, and Putin denied, the Russians may also have been correct. 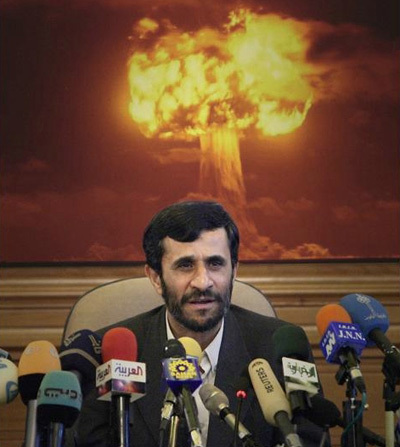 Iran may already have the technology, missiles and the nuclear bombs to hit Tel-Aviv and Europe. Sify News Service - “Pakistan has rejected the demand of US lawmakers for direct access to nuclear scientist Abdul Qadeer Khan, saying it alone can probe into allegations that he proliferated the country's nuclear secrets. "We have made it clear, at every level, that no outside authority can interview Dr Khan," a senior official of the foreign office told IANS. This arsenal of Weapons of Mass Destruction, according to the Prophet of Israel, is about to be destroyed or taken control of by the enemy of the State of Iran; the “Great Satan” called America. As noted in the Prophecy of the Ram and the He-Goat in Daniel eight, we take notice that the Persian Ram will be taken down with great fury by the Grecian He-Goat. In modern literal interpretation, the Western Occidental world of the Economic globalists, the European Union and the United States, represent the ancient mantra, that “Greece is the Face of Rome”. It is paralleled in biblical typology as America, the world’s greatest purveyor of national Grecian democracies, and truly is the dominant world power (face) of the former nations of Spain, Italy, French, German Gaul and Grecian Macedonia that were under the dominion of the Ancient Roman Empire. According to the Prophecy of Daniel 8, the Grecian/Roman power will be opposed by the Eastern Oriental world of the Leninist, Marxist Communists world powers. It is they that use Persia/Iran as their most potent visible “client state” asset. The question still obscure in biblical prophecy, will it be the “Great Horn” of America who will take down Iran or will it be the Zionist State of Israel, the most potent visible “client state” asset of the Western Occidental Economic World of the “democratic nations of Greece”, that will be chosen to “stomp” Persia/Iran into the ground? We will wait and see how the Eternal One of Israel will choose in His sovereign wisdom how the collapse of our present world order will merge between the Economic West and the Totalitarian East into the final transformation into the Totalitarian One World Economic Order.